Honestly the last three weeks have been pretty uneventful in the pregnancy world. I still have my cold. I'm trying to get a few workouts in each week. Drinking enough water is a daily struggle. Oh, my back hasn't been hurting though! 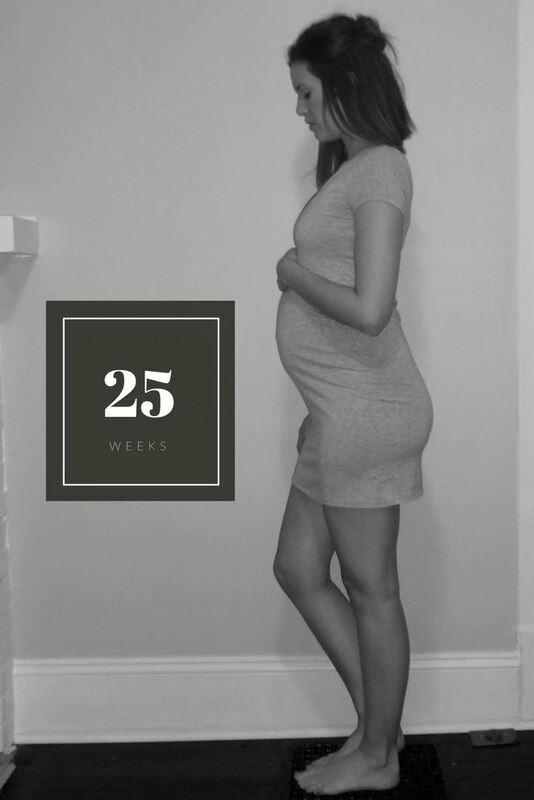 I'd say the most newsworthy event of the past three weeks was my doctor's appointment at 25 weeks. It was actually supposed to be at 24 weeks, but a snowstorm closed the office and I had to reschedule (not until AFTER we had already drove to the original appointment). Anyway, the appointment went like it always does at first. Go to the office and check in and wait 15 minutes in the waiting room. Pee, weigh-in and check blood pressure when you finally do get called back. Sit and wait for the doctor again. This time I knew my appointment would be different than previous, I had questions. I never have questions. A C-Section is on the table this time around because of some of the damage Leighton did when I delivered him. That being said, I had questions. "What happens if I schedule a c-section then go into labor naturally? Barring complications, will I still get to have skin to skin time with him shortly after birth, nurse as soon as possible, will he be in the room with me while I recover immediately post-op?" We are also going to a wedding 11 days before my due date in Fort Wayne, so I had questions about that as well. My doctor answered all my questions and made me feel very comfortable with the whole process of the c-section. Then we talked shots (flu, pertussis and RhoGAM) and it was business as usual. Anyway, if anyone has any tips about c-section prep/recovery I would love to hear them. Nothing is set in stone, but it will be a definite possibility. On to the weekly updates. Like I mentioned, I haven't been having many symptoms to speak of. My back feels much better, but my nosebleeds are still happening. Sleeping is getting super uncomfortable. Buffalo sauce is a craving lately. I had wings three times in seven days. Little man is the size of a pomegranate measuring about 11.4 inches and weighing around 1 pound. His fingernails are almost fully formed, his ears are developing, his pancreas is maturing and he has sweat glands. He is now approximately the size of a grapefruit - 11.8 inches and 1.3 pounds. He is practicing breathing by inhaling amniotic fluid and his lungs are starting to produce surfactant (keeps the air sacs in the lungs from collapsing). His face and body are starting to fill out and he is looking more like how he will at birth. Hud is now the size of a zucchini, and measures about 13.6 inches and weighs approximately 1.5 pounds. His spine is forming its structures, blood vessels in the lungs are developing and he has fully formed fingerprints. If I thought he was moving a lot before, he is now doing an Irish jig any time he is awake. It is still such a surreal feeling to know you are growing a life. I love it and I can't wait to meet him! Leighton is still not completely understanding of what is going on, but he now uses my stomach as a pillow and we talk to him about the baby a lot. I think he is going to love having a little buddy though. Seeing them grow up together will be fun. I am super curious though if they are going to look like total opposites. I mean what are the chances I end up with two blond haired, blue eyed boys?! Thanks for stopping in! Follow along with our life on Snapchat and Instagram, katianne1519 on both!